Line a 9 x 5-inch loaf pan with wax paper, overhanging the edges by at least 2 inches. Lightly oil the paper and set the pan aside. Stir until the sugar is completely dissolved and the mixture comes to a boil. Clip a candy thermometer to the inside of the pan and cook without stirring until the syrup reaches 260°F (hard ball). Turn off the heat and cover the pan to keep the syrup warm. Combine the remaining 1 cup water with 2 cups confectioners' sugar and the cornstarch in a heavy medium saucepan. Set the pan over medium heat. Stir until the sugar and cornstarch completely dissolve and the mixture comes to a boil. It will quickly become a thick paste. Immediately add the warm sugar syrup and stir until the mixture is creamy white and smooth. Return the mixture to a boil and cook for 5 minutes, stirring constantly. Add the almond extract and the almonds all at once, and mix until thoroughly combined. Spread the mixture into the prepared loaf pan. 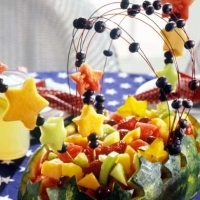 Let the candy rest at room temperature overnight or until it is firm, at least 6 to 8 hours. Remove the candy from the pan by lifting the wax paper. Sprinkle the top of the candy with the remaining 1/4 cup confectioners' sugar. Cut the candy into bite-sized pieces and roll each piece in additional confectioners' sugar to keep them from sticking together. Store the sugared pieces in an airtight container, in layers separated by wax paper, at room temperature for up to 2 weeks. Apricot Turkish Delight: Substitute 1/2 teaspoon vanilla extract for the almond extract and 1/2 cup finely chopped apricots for the almonds. Banana Almond Turkish Delight: Substitute 1 teaspoon natural or artificial banana flavoring for the almond extract. Lemon Turkish Delight: Substitute 1/2 teaspoon lemon extract for the almond extract. Mint Turkish Delight: Substitute 1 teaspoon mint extract or 1/4 teaspoon peppermint oil for the almond extract. Omit the nuts. Pistaschio Orange Turkish Delight: Substitute 2 teaspoons orange-flower water for the almond extract and 1/2 cup whole shelled pistachio nuts for the almonds. Red Hot Turkish Delight: Omit the almond extract and almonds. Instead, add 1 teaspoon crushed red chili flakes and 1/2 cup pecan pieces. Rose Turkish Delight: Substitute 2 teaspoons rose water for the almond extract. Alexander kassal, "Give me a vword, any vword, and I show you de meaning of dat vword is Greek...put some vWindex on it..."
Thank you! I love these & they're too expensive in the candy store. Can't wait to try making them at home. Really great recipe, but the Turks 'borrowed' the idea from what the Greeks invented and called Loukoumi! I love this dessert... 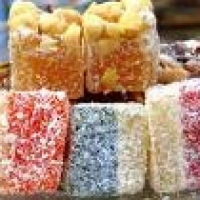 I buy Turkish delight in Turkish food stores or restaurants... Mmmmmm, I have tried to prepare it but last time was a mess! Hope to try it again! Thanks for share it.